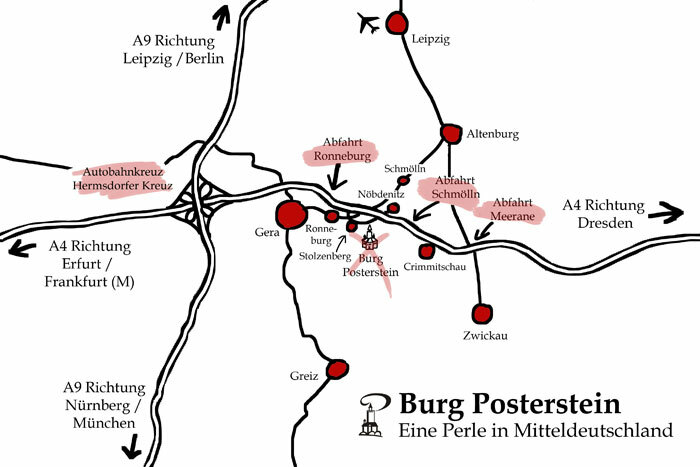 Motorway (Autobahn) 4: Erfurt – Dresden, exit Ronneburg, federal highway in the direction of Ronneburg, take exit to Posterstein in the roundabout, turn the next one left and follow the signs to “Burg Posterstein”. This road is not suitable for coaches! 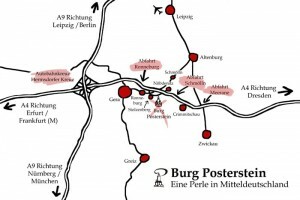 Motorway (Autobahn) 4: Erfurt – Dresden, exit Ronneburg, federal highway in the direction of Altenburg, exit Nöbdenitz – follow the signs to “Burg Posterstein”. The next train station is in the neighbouring village Nöbdenitz. You walk or bike the hiking / bike trail along the small river Sprotte to Posterstein (about 2 kilometres in beautiful nature).